ESA's Mercury spacecraft has passed its final test in launch configuration, the last time it will be stacked like this before being reassembled at the launch site next year. Once at Mercury, the orbiters will separate and move into their own orbits to make complementary measurements of Mercury's interior, surface, exosphere and magnetosphere. The information will tell us more about the origin and evolution of a planet close to its parent star, providing a better understanding of the overall evolution of our own Solar System. To prepare for the harsh conditions close to the Sun, the spacecraft have undergone extensive testing both as separate units, and in the 6 m-high launch and cruise configuration. One set of tests carried out earlier this year at ESA's technical centre in the Netherlands focused on deploying the solar wings, and the mechanisms that lock each panel in place. The 7.5 m-long array of the Mercury Planetary Orbiter and the two 12 m-long array of the Mercury Transport Module will be folded while inside the Ariane 5 rocket. Last month, the full spacecraft stack was tested inside the acoustic chamber, where the walls are fitted with powerful speakers that reproduce the noise of launch. Just last week, tests mimicked the intense vibrations experienced by a satellite during launch. The complete stack was shaken at a range of frequencies, both in up-down and side-to-side motions. These were the final tests to be completed with BepiColombo in mechanical launch configuration, before it is reassembled again at the launch site. In the coming weeks the assembly will be dismantled to prepare the transfer module for its last test in the thermal–vacuum chamber. This will check it will withstand the extremes of temperatures en route to Mercury. The final 'qualification and acceptance review' of the mission is foreseen for early March. Then BepiColombo will be flown to Europe's Spaceport in Kourou, French Guiana, in preparation for the October 2018 departure window. The date will be confirmed later this year. "This week was the last opportunity to see the spacecraft in its stacked launch configuration before it leaves Europe. The next time will be when we are at the launch site already fueled," says Ulrich Reininghaus, ESA's BepiColombo Project Manager. "This is quite a milestone for the project team. We are looking forward to completing the final tests this year, and shipping to Kourou on schedule." The spacecraft was on display today in the test centre as part of a dedicated media briefing. A replay of the livestream is available here. 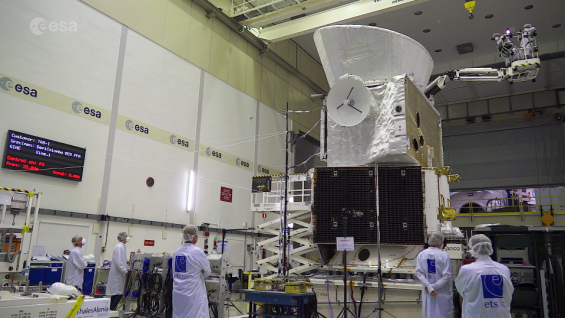 Recent images of BepiColombo in the test centre, along with artist's impressions of the spacecraft, can be found here. 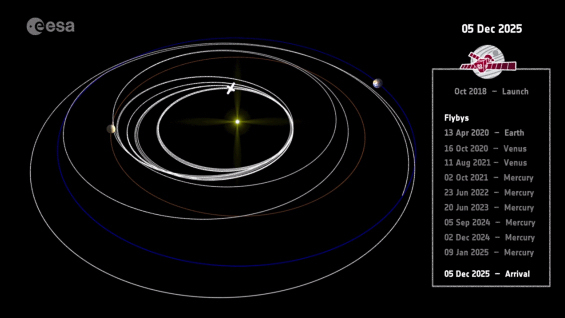 For detailed information about earlier testing, see the BepiColombo journal archive.